Two Cadets from 84 (Coventry Airport) Squadron have been chosen to represent the UK as part of the winning team in the Jaguar Land Rover Sponsored F1 Schools Programme. Now crowned the UK Champions 2014, the team will jet off to the World Finals in Abu Dhabi in November along with tickets to the F1 Grand Prix at Silverstone this year, a tour of the Williams Team Factory and much more! Cadets Thomas Govern (aged 15) and Ryan McLaren (also aged 15) made up 50% of the winning team from North Leamington School. The team spent many months perfecting the design on the ultimate F1 car and putting it to the test on the 20 meter track also scooping the winning time of 1.128 seconds! Team Whittle Wonders worked diligently in their assigned roles and the work paid off with their winning design! Ryan McLaren took the role of Manufacturing Engineer whilst Thomas Govern lead the design elements and together the team perfected the build as well as creating a pit display, printed portfolio and then presenting their design to the panel of judges. 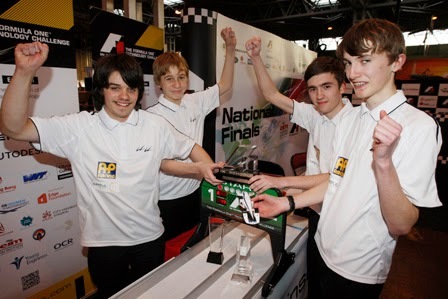 Jaguar Land Rover, who sponsor F1 in Schools as part of its ‘Inspiring Tomorrow’s Engineers’ school STEM education programme, have highly praised the local winners and look forward to continuing to support them as they finalise their designs for the world championships later in the year. The Squadron is very proud of these two inspiring cadets and wish them all the best for the world finals in Abu Dhabi!